However, several commenters argued that the results were an artifact of increasing "financialization" of the US economy. Presumably the idea is that financial services involves a lot of creation of measured value but little oil consumption. This idea is not well supported by the data. The graph above shows yesterday's data for oil efficiency on the right axis along with the fraction of GDP due to financial services and insurance (right axis - data from BEA). While it is true that financial servies has grown from a little under 3% of the economy to 6% by the year 2000, this is nowhere near enough to account for the more than doubling of the oil efficiency of the entire economy over the same period - clearly the other 95% or so of the economy must have got a lot more oil efficient also. It's also notable that the pattern is quite different - financial services as a fraction of the economy peaked in 2000 and has been slowly and fitfully declining since then, so it seems very unlikely to have much to do with the sharp accelerations of oil efficiency in 2007-2008 or 2010-2011. The US pattern closely matches global oil consumption over global GDP ($1000 in 1980 to >2000 now). Fact is, America consumes five times the global average of barrels per capita which has been stable since 1980 (25 vs. 5). This is not sustainable and only permissible so long as the dollar remains a petrocurrency. Oil was 60% of the US trade deficit last year. I wonder how much longer this trend could be expected to continue? 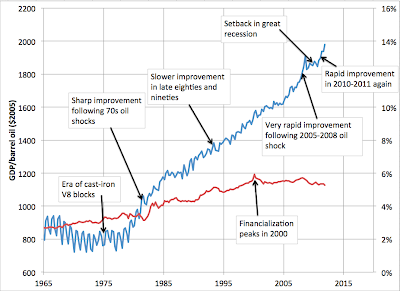 Presumably, without radical structural shifts in the status quo or radical changes in technology, oil efficiency can only be expected to increase to a point. A lemon can only be squeezed of so much juice before the effort isn't worth the last few drops. Also, what does it say about global oil supply when, despite this trend of increased efficiency, oil prices remain so stubbornly high and gas prices are on a tear to record highs? My feeling is that we're probably in more trouble than we might think we are. Interesting. Honestly, I would have thought the effect would have been greater. If you normalized both those data sets, the financialization pattern would more closely match the efficiency data. Over the period, efficiency went from 800 to ~2000 (about 250%), while financialization appears to have gone from about 2.5 to 5.5 (about 220%). You definitely appear to be right about the peak in 2000, which surprises me. What happens if you roll Real Estate in with your Fire/Insurance numbers? My guess is it would improve the match. My feeling is that in addition to the true energy-saving movements that result from energy price spikes, globalization probably plays a significant roll. Check out the foreign investment numbers at the BEA (http://bea.gov/iTable/iTable.cfm?ReqID=2&step=1) and you get a chart that has really taken off over the same time frame as the efficiency graph. In any case, these are interesting series because it's really hard to isolate behavioral change from the side-effects of the way we measure the economy. I'm not sure this makes any sense, but could not globabalonization (TM) be externalizing the least energy efficient activities (or at least allowing them to be more "efficient" than they would otherwise need to be with domestic environmental and labor laws at least partially heeded)? You have shown that the derivative of wealth (GDP) is increasing per energy consumed. Can you reconcile the two conclusions? This trend is an example of a larger trend that Alan Greenspan, among others, used to focus on. It's not financialization, but everything. As the economy's activities become more digital, or whatever we do make becomes literally lighter (like cars or beverage containers), the need for energy to move stuff around gets lower. Over at Econbrowser a commenter, uber_snotling, posted a list of GDP per unit of energy for various countries from the World Bank (data.worldbank.org/indicator/EG.GDP.PUSE.KO.PP.KD). The figures were for 2007 and 2010. One of the interesting ones was Spain, which has increased its energy productivity quite dramatically. As you know Spain had a massive construction boom through to 2007 - not only housing, but also a motorway system. This suggests that construction is quite energy intensive, with much of that energy being oil. In the US, oil efficiency has improved since the collapse in new housing construction. Greg - it also occurred to me that a bunch of construction workers driving around in pickup trucks (and real estate agents in nice cars) might well not be the most oil efficient parts of the economy. However, the details of the timing of the improvement right before the great recession, fall during it, and then increase again in the last 12-18 months make it hard for that to be the main story I think. Transportation isn't the only user of petroleum ("V8 blocks"). See: EIA Total Energy, Energy Perspectives 1949-2010 (http://205.254.135.24/totalenergy/data/annual/perspectives.cfm), chart 13, "U.S. Petroleum Consumption Estimates by Sector, 1949-2010". In '78 transportation was only 54% of oil use. Today it's 71%. Put the other way, in '78, residential, industrial, and electricity production used about 66% of petroleum. Now they only use 29%. "This trend is an example of a larger trend that Alan Greenspan, among others, used to focus on. It's not financialization, but everything. As the economy's activities become more digital, or whatever we do make becomes literally lighter (like cars or beverage containers), the need for energy to move stuff around gets lower." 1) We are literally drowning in stuff as opposed to even 30 or 40 years ago, let alone times before that. 2) If all this economic activity doesn't translate into physical things, what exactly is it doing? Are we financing books? Movies? Software? Big collections of 1's and 0's in banking computers? Where exactly is it going if it doesn't translate into a physical product? I also have to say that graph is not what I expected at all. I've taken another look at this graph. Something seems strange about it. What we call GDP is always kind of debatable. But if you look the value in 2005 was 1600. Right now it is about 2000. Whatever we are measuring, what exactly has had a 25% increase in efficiency in 7 years? I presume your numbers are corrected for inflation. But what about the huge sums the fed and the government have done... whatever it is they have done with it since 2008? Someone mentioned that Real Estate might not be included in this. I know the stock market bubble burst about 2000, but the drastic run up in housing prices didn't push that graph up since 2000? "Timothy Garrett has shown that the integral of GDP (wealth)"
Always surprise to read stuff like that, once you have bought, eaten, and "evacuated" something you have piled up some wealth somewhere ? Once you have bought some gallons of gas, burnt it to move from A to B, you have piled up some wealth somewhere ? Always this "economy is growing" thing trying to forget that it is still primarily about flows. Yes the big ressource eating machine that is the economy can grow, doesn't change the fact that it remains a big machine requiring input flows and producing waste output ones. Very interesting. I think that as one earlier commenter noted, the shift away from oil in electricity generation, industry, etc. 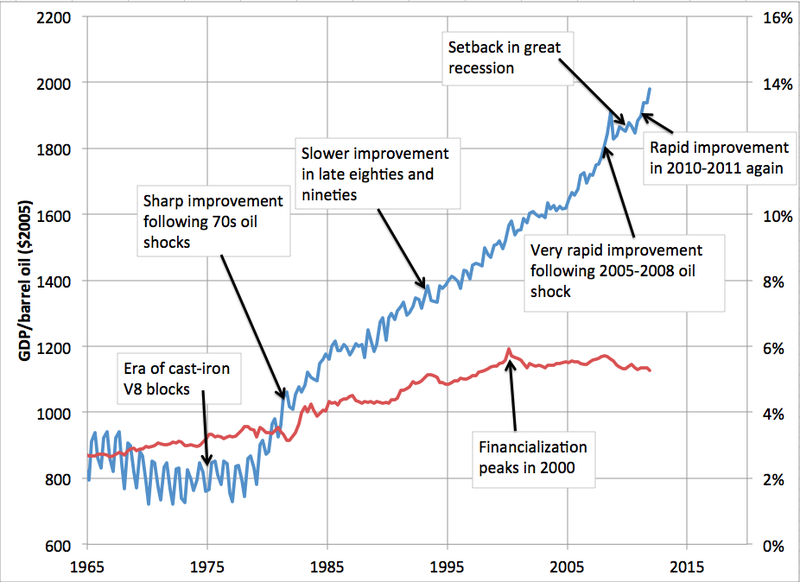 explains the move up in efficiency after the 70's oil shocks. The more recent move must have something to do with the fact that reported GDP keeps increasing and is now above the pre-recession level, while the number of people who actually have jobs is still some 4 or 5 million below the 2007 high. It just doesn't make sense in many cases for people to commute long distances to low paying jobs, which are often the only ones available, so people just don't do it. Government deficit spending to support the economy appears to have had its effect primarily at the upper end of the income spectrum, as one would expect, given the policies pursued. Those sectors of the economy (high end goods and services) are naturally less energy intensive than the economy as a whole. Part of the story, perhaps.